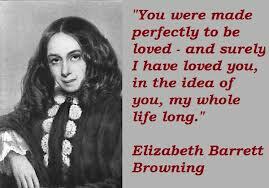 Today is the anniversary of the birth of romantic poet Elizabeth Barrett Browning. Her poetry is much quoted, and is used often at wedding ceremonies as the words speak of love, which is unchanged through the centuries. But my favourite is this one, called “If Thou Must Love Me”. In it, Barrett Browning entreats her man to love her for love’s sake, and not for any superficial reason such as looks, and nor just to make her happy…. as that sort of love doesn’t last.